We went to Legoland over the weekend. One of the rides is a water chute – where you step into a little boat and skim extremely quickly. This was a popular ride as it offered an exhilarating feeling. Naturally the queue was long. One family worked out how to beat the queue. Two grandparents were standing just ahead of us, very close to the `30 Minutes to Go’ sign. Two girls, one aged around eight and the other about ten suddenly slipped past all of us waiting in the queue and joined their grandparents. Naturally they beat the queuing system. Their parents, you see had joined the end of queue at the same time the girls joined their grandparents. The girls were on a winner. I know the grandparents and the girls were very happy that they had beaten the system. Now I am sure that this family wanted their children to become professionals. Perhaps one of the girls will one day become an accountant. What happens when one of her clients approaches her with a system to beat the tax system? Does she smile and giggle and help the client to jump the queue? What about the other girl? Will she one day become a doctor? Will she encourage queue jumping in her practice? At times we must all wish that there was an opportunity to take a short cut towards success in the eleven plus. Some families will always want the easy way out. The rest of us just have to do the work. Many years ago my father took me to a Mission School. Mission Schools were run by various faiths – and are what we call our Church Schools today. We went to the school because someone had died. We went to a funeral. The venue? Hope Fountain in Zimbabwe. I can remember a service and songs in the church. The singing, as ever, was loud and vibrant – a real mixture of traditional `Church’ songs as well as songs from Africa. There was a Church choir and their singing was sweet and poignant. They were singing for their departed Head Teacher. We walked outside and the clouds had rolled up very quickly. As the mourners gathered around the grave we all knew that rain was very close. The coffin was lowered into the grave and one by one stones were picked and dropped into the grave. The rain came down – very hard. The line moved on – one stone at a time. The sky was very black. The ground around the grave was wet and slippery. A couple of the Europeans attending then picked up more than one stone to hurry the proceedings along. Teacher. Quiet. (There is complete silence.) This is all very interesting – but not to the point. (Wilson screams with pain.) Who was that? Was that you Wilson? Wilson. Sir, I was jabbed, sir. Wilson. With a compass, sir. Wilson. I don’t know, sir. Teacher. Well go back to your place and make sure it does not happen again. We know that a conversation like this can not happen today. In the first place where can we find a child who is going to call a teacher `sir’ on so many occasions? Secondly we expect our teachers to show more concern from the start. We can translate the staccato rhythm of the conversation to the eleven plus. Father. Have you done the eleven plus paper your mother asked you to do? Wilson. I was waiting for you. Father. Why didn’t you to complete the paper while I waited? One of the great benefits of the present system of taking driving tests is that people are offered a second or a third chance. I have always taken the stories of people who have taken the driving test nineteen or twenty times as being apocryphal. Just think of that poor driving instructor. Think of the number of times the driving instructor has had to gear himself or herself up to engage in a lesson with the pupil. Think of the feelings in the instructor’s heart as he or she sees the car approaching along the road ready to turn into the test centre. Will there be a pass or a fail? Think of the feelings of the poor prospective driver as the wait for the dreaded words approach. At least the end is swift. “I never felt a thing!” A learner driver knows about pass or fail immediately. Children involved in eleven plus examinations have to wait an unconscionable amount of time before their results come through. I wonder if there is any way this process can be speeded up. Let us try to track the examination paper after your child has walked out of the examination. The head examiner or invigilator collects the papers, places them in an envelope and put the completed papers immediately into the safe. A courier collects the papers the same day and delivers them to be marked. The papers are fed through a reader – and software will automatically give a raw score – how many questions are correct, and a standardised score – to make the test as fair a possible. The results for the whole school could be collected and collated within minutes. This probably takes no longer than the time it takes the driving instructor to unbuckle the seat and complete the form before half turning to face you. So surely the children who have definitely passed could be told immediately. The children who did not do at all well and have no chance could also be told immediately. This leaves us with the small percentage of children who, on this occasion, just do not have the right combination of marks. So this is a plea on behalf of all those parents with a definite yes or a definite no to be informed quickly and painlessly. This could be as much as 90% of the parents. So the only mums and dads who have to get nervous or anxious are those parents with results that are nearly passes or nearly fails. If this poor cohort of parents is around ten percent then it is evident that these are the only parents who need help and support to get through the uncertainty of their child’s success. What happens when you hear of a mother labelled as a `pushy mum’? Mums push their children for a variety of children. Very often they simply want their child to do better than they did. Other mums will want their child to have the same opportunities that they had at school. A few mums will become pushy simply because they are competitive. It is very unlikely that a mother will become pushy over eleven plus examinations if she has not already been pushy over pram sizes, colours in the nursery and what to wear on the first day to school. So all you can do is admire her for her effort – but you can not afford to get caught up and try to compete. If you push your eleven plus child too much you will not ever allow him or her to feel good and pleased. All you will have done if you push too much is to set yet another target to beat. I have heard mums talking to their children about results on papers. That sort of statement may work very well once or twice but that sort of pressure simply can’t be maintained. Sometimes parents want their children to do so well at school that they push them beyond their natural ability. Some average children can be helped to above average levels by intensive coaching and hard work. This does not always mean that the child will be able to maintain the same standard as and when the pressure is taken off. There is nothing at all wrong with being an average child who is happy at school. Mums sometimes take it personally when it is suggested to them that it may be time to back off and just let their child be an ordinary child for some time. I remember years ago two charming children who were given cricket coaching by the equivalent of a county professional. The children were never going to be good enough to make a school cricket team – but their parents wanted the children to have the best possible opportunity. This is not quite the same as parents who want their child to get into the cricket team and so provide the best possible coaching. The problem for many of us is that a child who may be exceptionally bright at something aged two years may not develop into an exceptional child at ten years old. We need to add into the equation the child’s motivation. It may be your dream for your child to go to grammar school. Your child may say that he or she wants to go to grammar because you have been on and on about the advantages of grammar school. For your child to start to dream about going to a grammar school is a very different matter. Your child may `grow’ into the idea but you may be pushing too hard if you force your child to work simply by the strength of your personality. Suppose that your son takes an Eleven Plus Verbal Reasoning test one day and achieves a certain score. He then returns the following week to take the same test and achieves a different result. We need to assume that he has not discovered the correct answers in the interim. We also need to assume that his intelligence has not changed in a week. We also pray that there have been no mechanical errors in marking the two tests. We would probably be able to say that it is likely that the scores would be different. So what could account for a difference in scores on identical tests? The amount of sleep the night before. The type of breakfast eaten in the morning. Feeling about the person administering the test. Distractions in the testing environment. An argument with a sibling. So now we can look at whether boy or girls would have greater differences in their scores. There are naturally two ways to approach the question. The first is by logical analysis. So we have to say there can be no difference between the scores of boys and girls – otherwise we would have to give different tests to boys and girls. The other way of looking at the problem is by statistical analysis. So we know that girls do better than boys in some areas but we are not all that certain why. So do we look at the difference in scores and think that girls will probably do better on a re-test a week later than boys would? We need to remember at this stage that we are talking about the same test with the same questions under the same conditions. So if we are going to get variations of results from a formal testing session we naturally must expect variations in results of work when children are doing tests after school and on the weekend. Be patient with your child. Let all these different factors flash through your mind before you comment on a difference in results. Above all don’t take any variation personally. It is very unlikely that your child is being difficult. There just may be circumstances beyond his or her control. So what can you do to try to help your child to do some extra work on those `bad’ days? Try to be relaxed and confident. You know your child will do the work in the end. There is no need to keep on and on. Discuss various options but don’t try to land up having a set to about work. Try to take as much interest as possible in what the actual problem is. It may be that the exercise your child is stuck on is simply too hard. If so suggest a change of topic with the promise to return to the hated one on another occasion. It may not be the work that is worrying your child – it could be that the time that has been selected is simply unattractive. If a certain school day is tiring then why not rearrange the study time? You certainly don’t want to argue about work. You just want to do the best you can. I went yesterday to the scene of a murder. I know this was rather ghoulish but the murder took place 837 years ago. Thousands of other pilgrims have made their way to the cathedral over the years. Prayers have been held at the site for over 1400 years – and around two thousand services are held every year. As you face the main entrance to the cathedral there is a row of terraced houses on the left hand side. There is nothing particularly remarkable about the houses – other than their proximity to the cathedral. The evening was rather chilly. We were all wearing coats. By seven in the evening the crowds of foreign school children had disappeared. A table with six chairs had been placed on the cobbles and six determined men and women were having their meal outside one of the houses. Two of the women were wearing woolly hats. The table was laden with wine and food. There was lots of laughter and noise. Possibly more noise than a group of over sixties usually made at a meal – but the party was happy. The reaction of the passers by varied considerably. If only the Eleven Plus had elements of history. Who was the priest that was murdered? Which cathedral was visited by thousands of pilgrims on their way to the Holy Lands? Why was the king forced to walk towards the cathedral dressed in sack cloth and ashes? Poor children, imagine having to work on a beautiful Saturday evening. Today is Saturday. This means that the weekend is in full swing. Eleven Plus parents and Eleven Plus children will be doing the `Eleven Plus’. It sounds as if there is a song in the words `Doing the Eleven Plus’. `Doing the Eleven Plus’ could even spark a prime time Saturday night competition where grown men cry their eyes out before seven million people. The men would be crying because they could not answer the eleven plus questions. Question 1. What is the derivation of the word `Barmy’ and what it its relationship to the Eleven Plus examination? We know that we should never use this word when talking to our children. We think that barmy is a slang word for the feeble minded – but we are not 100% sure. A possible explanation is that that it comes from Barming in Kent – where the county’s lunatic asylum was situated. The word barmy then is applied to a rather unexpected eleven plus answer. Question 2. What is a Hall Mark – and how is one awarded for the Eleven Plus? A Hall mark is the official stamp used at Goldsmiths hall in London. The Goldsmith Company marked gold and silver articles. So a Hall Mark is a distinctive mark or token of genuineness, excellence or worth. Question 3. Where is the significance of the word `marathon’ in the mythology of the eleven plus? We know that the marathon was a running race over 26 miles and 365 yards. Now we use the word for a protracted event. The event could be wage negotiations – how much any marks over 89% are worth. The word marathon can also be sued in international talks – if passing the eleven plus is worth a trip to Disneyland Paris or Florida. So we now have all the ingredients of an eleven plus rallying song. We know that at times we will feel a little barmy. We know too that at times we will feel the need to have our efforts rewarded. And finally we know that the eleven plus journey will be long and arduous. All we need now is the BBC Light Orchestra; twelve weeping would be Josephs and four well meaning judges. (It all sounds rather like preparing for an eleven plus appeal.) The contestants will need to write the words, prepare the lyrics and sing the songs. All this amounts to about the same angst and emotion that every eleven plus parent goes through. Doing as well as possible! That is a positive statement of intent. It does, however, raise a few little problems. We are going to need to come to terms with a few minor objectives along the way. So the first statement is really an aim. You would really like your child to win a place in a favourite grammar school. The second statement is more of an objective. You can measure the time element. Your child can or can not be offered a place. The place may or may not be at the school of your choice. We now have three further objectives to list. These three new objectives are now more specific and measurable. Now why are you putting yourself through all this analysis and preparation? Setting objectives will help you to fulfil your side of the eleven plus equation. It will help you to clarify your intentions and it will make it easier for you to gauge the extent to which your intentions have been fulfilled. So now you need to think of an objective that is readily testable. “By the end of the month you will be able to remember to read instructions twice.” This you can test – and it is achievable. The value of you preparing objectives of this nature is that your child will have an agreed `Statement of Objectives’. This will give your child a framework of expectations that you and your child have agreed on. If your child has a reading problem then you may have an objective of trying to help your child to choose the sort of books that he or she may enjoy reading. If you set the weighty objective of trying to make your child into a reader as well as passing the eleven plus you may be asking too much of both of you. If you simply write down all the different topics the two of you are going to study in mathematics and reasoning then all you are doing is working out the course of study your child will follow. Essentially, by writing objectives, you are trying to change your child’s attitude and behaviour. Your objectives could attempt to include the elements of behaviour and attitude. Another reason for taking the time to write out lists of objectives is that you give your child the power of choice. If you set out objectives to be achieved by a certain date then your child could pick and choose when and how to do the work. This takes the pressure off both of you. After all, your aim really is to try to help your child to do as well as possible in the eleven plus examinations. A man who crossed a river in 49 BC still has influence over us. All those years ago Julius Caesar crossed a river with his legions. The river was the boundary between Rome and one of the provinces. Once he crossed the river he was in fact declaring civil war. It is always a little strange to call a war `civil’. If we are civil to our elders we are polite and well mannered. If we enjoy a civil wedding then we are participating in a wedding where marriage vows are exchanged . The religious element of the wedding, however, is by choice and not decree. The civil rights movement was associated, for some time, with peaceful protests. Violence erupted only when the authorities became upset. But when Caesar crossed the river he crossed the Rubicon. We know that crossing the Rubicon is a decisive and irrevocable step. In just a few months time you will be taking a final and irrevocable step. You will be filling in a form where you are writing the senior schools in order. You are offred a choice – and you really do get to choose at this stage. Later on you may not be offered the school of your choice but at least for a few moments you will have had a choice. You have been exercising your civil rights. One you have completed, and sent the form off, you will have `Crossed the Rubicon’. Lets us go back now to the concept of being civil. While you are working towards the eleven plus you still want your son or daughter to be civil to you. You can not demand your rights over your child otherwise you may provoke civil war. Your choices of school may not coincide with your child’s choices. You are going to have to be diplomatic and ask your child’s opinion. You are going to have to be civil to your child. In the months leading up to the examination you will not be able to think about engagements, weddings, christenings or even death. It is funny how focused and single minded you will become. Your conversations will be directed towards `chances of passing’ and `standard scores’ and even `alternate angles’. You will stop buying clothes for fear of upsetting the Gods of Chance. You will always fold your arms twice to make sure that no evil sprits can enter your body. You will not step on any lines. You see you have Crossed the Rubicon. You took that decisive and irrevocable step to enter your child for the eleven plus. Oh dear! There is, however, one element that you still have control over. We understand that the river that Caesar crossed is now called the `Pisatello’. It is a river in Italy just north of Rimini. My brother and I crossed the Pisatello the year before last. There were mountains and deep valleys with trees. Julius Caesar was not running about with his legions. So when it all gets a bit too much for you – phone a friend. Buy a ticket for two to Rome. Hire a Ferrari. Leave all thoughts of your family behind. Buy a case of deep red wine. Lie back. Forget about examinations for a few stolen hours. We have all used the technique refined by Socrates of asking questions when we already know the answer. At a very simple level the question: “Have you been a good boy today?” can be a really cruel question when you know very well that your son has just spent the afternoon playing on his play station. If you knew that he had spent the afternoon on his play station, why did you ask the question? Quite simply you wanted your son to take responsibility for his actions. Socrates was very involved with the moral aspects of life. He used his question and answer technique to encourage people to think clearly and avoid red herrings. I am sure we have all been told at one time or another that we should never ask a question if we did not know the answer. Socrates used questions to encourage a person to examine his or her beliefs. Once the beliefs have been `extracted’ then Socrates forced his students to examine the validity of their beliefs. A valid and logical answer! Socrates would have been proud of your son! We were asked yesterday where we find our teachers – or more importantly where do out teachers find us. Now here is a little story – and it seems quite incredible. The teacher in charge of one of our centres was recommended to us by a member of the senior management team of her school. He had had his son with us for help towards the eleven plus. Our teacher was then an A level student and he thought that she would enjoy working with us. Our teacher stayed with us for two years as an `A Level Assistant’ and continued teaching for us while she attended university and then went on to qualify as a teacher. She stayed with us as an NQT – and we are privileged to claim that she is still with us some years on. In fact very nearly ten years! We all know that she will be a headmistress one day. Our highly efficient LSA has had two children who have worked for us. Her children attended eleven plus classes with us. One has gone on to university while the other is still at school. This is a real family concern. Our most senior assistant did eleven plus classes with us and she returned to teach for us when she entered her A levels. She is still with us while she is at university – doing very well. We are very proud of her – and the children simply love her. There are three other A level assistants – all of whom did eleven plus work with us – and then returned at the `A’ level stage. Two of them were helped towards the eleven plus by one of the teachers mentioned in this little tale. The one A level person who did not do eleven plus with us has a sister who teaches for us. The sister in question also joined us as an A level student. She then trained as a teacher, and is still with us ten years on. She has the ability to give children confidence – a very rare skill. So in this centre we have teachers with deep roots. Our LSA trusted us with her children. Our assistants did eleven plus work with us and are now sharing their skills and their enthusiasm. We are very grateful to this team. This is very likely a unique situation in the whole history of education in the United Kingdom. We all adjust they way we speak according to the people we are talking to. We change our language according to subject matter, and who we are addressing. Children have one language to use in the classroom. There is the language of the playground. Then there is the different words they will use when they speak to their brothers and sisters and to you. Some ten year olds will also have the language of the mobile phone. This represents a big shift in communication skills. Our children now have new ways of spelling words, new words to and an entirely new method of communicating. So when our children are called upon to write a story we expect them to be able to come up with language that is similar to the way words and ideas have been used in books for many years. We want a rich vocabulary in the conventional school story. Texting, however, does not need a rich vocabulary. In a traditional story we demand a beginning, a middle and an end. Texting implies a conversation – so there is no real end. We want our children to be able to spell correctly – even on long words – but texting changes the ways words are spelt. So I wonder when those involved with writing verbal reasoning papers will catch up with today’s child. Any changes in the language of verbal reasoning papers would involve a big shift of attitude towards children and the present reliance of vocabulary as being a key factor in intelligence. What happens when your child is faced with a string of words in a verbal reasoning exercise and he or she is now sure of what the words mean? The word `dissect’ means to cut open and examine. Your children may have seen pathologists on TV cutting corpses up to determine the cause of death. The clue lies in the spelling of some of the letters within the word i.e. `sect’. In Latin this means to cut. The `dis’ part of the word also comes from Latin – meaning apart. So when we hear the word `dis’ thrown into the conversation we know the origin of the word means apart. So if your child want to `dis’ someone you know that you now have a little more ammunition for serious talk on correct and proper English. Just remember to throw in those few extra words about the origin of `dis’. This may come in useful in the verbal reasoning examinations. When we are talking about timing we have to go back in time. Many years ago the great composers were not as preoccupied with timing as we are today. A composer would often leave the timing of a piece or passage to the performers. A performer today still has the opportunity to interpret a passage or sing in an individual manner. Singing karaoke is a possible exception. Then the whole point of performing is to try to sing notes as close to the original as possible. But music can not be a completely mechanical exercise. How ever hard a performer will try there will be a degree of variation. The same must occur in an eleven plus examination. You can coach your child and you can prepare your child as best you can. You can be the best teacher in the world – and even try to hire the best possible tutors - but there will always be a degree of variation between the final rehearsal and the actual examination. For your child may hesitate over a single word on the verbal reasoning paper. You child may even meet an unexpected problem with timing. You see children will never be mechanical in an examination. The word `tranquillo’ suggests a certain mood in music. You would not expect a piece to be played quickly or loudly or in a jerky manner. You do, however, really want your child to enter the examination feeling `tranquillo’, and confident about timing. When we are trying to prepare children for Standardised Tests we often need to do wider preparation than work solely on the expected items within the approaching test. If we are working on verbal reasoning, for example, we may also need to work on reading, language, listening, vocabulary and comprehension. Naturally we need to familiarise the children with basic test formats and directions. It may also be useful to be able to teach some test taking strategies for the standardised tests. The format for taking some multiple choice questions can very different from answering short answer questions. What you are trying to do is ensure, as well as possible, that your child is ready to be able to demonstrate he or she knows `on the day’. You just don’t want your child to be overwhelmed in the examination by an unfamiliar testing situation. Your work with your child should, when possible, be carefully prepared so that you too can demonstrate that what you know `on the day’. 1. Don’t start talking about on the next question while you are still working on one question. The other questions may be similar – but work one step at a time. This is how you want your child to behave in the test situation. 3. This next point may or may not apply to you or your child. Try to avoid changing an answer unless you are very sure that it should be changed. If your child is used to you changing your mind then don’t spend too long on this aspect of examination technique. 4. Prepare your lesson when you are working with your child. If you know that there are some difficult questions coming up then try to make time to look at the questions before you start working together. Above all you want to appear to be calm and collected. If you suddenly leap up in the middle of a range of difficult questions and feed the dog, put the washing on, answer the phone, sort out an argument and then try to return to the question feeling energised – then you may be setting your child a bad example. Doing maths in your head! We had a very bright child on our 11+ course today. He loved mathematics and worked very quickly through the course and then wanted more to do. He said that he loved solving problems. I think of two numbers whose sum is 26. Twice the first number plus three times the second number make 63. He followed his own method of working this out – and it took him about four minutes. His answers were correct. He explained how he had done the sum – but it was all in his head – with no working out. We have chatted about working out over the course – but he was simply irrepressible. Let x be the first number. Let y be the second number. And equation 2 becomes 2x + 3y = 63. Answer: The numbers are 15 and 11. Easy if you know how. Pretty good for a ten year old to do in his head! Your ten year old may need, or want money, at some time in their lives. Naturally their attention will turn towards making money by washing the car. Poor car. You will have advised them to remember to wipe the car down with a clean cloth. You will have advised them on cleaning the windows making them look as clean as possible. Equally you will have discussed with them how effectively the `Hand Car Wash’ specialist does the job. So you make the point to them that while you are prepared to pay £19.50 for a mini vac from a professional – you will only pay in the ratio of 2:3. You suggest that if the sum can be worked out correctly you will allow the job. You also confirm that you will pay in cash. Furthermore you will state that all previous debts are wiped out. The ratio of the wages is 2:3. This means that your child will be paid two thirds of the money. = (2 times £19.50) divided by 3. So your child is going to be paid £13.00 to wash, clean and vacuum the family car! I hope is going to be a good job! The man lowers toe-heel back onto his left foot, and the woman forward onto her right foot outside the man’s right side. The couple now continue with the basic quickstep. Continue to turn left; the man swings his right side forward past the woman and onto his right toes swaying left. The woman swings onto her left toes as she takes a smaller step to the side swaying to the right. Still flexed at the knee, the man drives forwards, left foot in line with the woman, and continues to turn left. The woman moves backwards with her right foot. To make the quickstep instructions comprehensible the couple may need a little help. The printed words are all very well but hearing the music and following the instructor glide around the floor will speed up the ability to learn the turn and, in time, remember what has been taught. It would help if the steps leading up to the turn have been learnt and understood. To remember the steps of working out how to find a percentage also assumes that your ten year old has some prior information. A percentage is out of a hundred. To find 1% divide by 100. It would help if your child knew how to divide by a hundred before the percentage exercise. If you are teaching dividing by 100 as well as percentages you may, a times, be asking your child to take on too much. So when you are working through examples on an eleven plus paper it does help to write out the steps. This will help you to focus on what has to be learnt. It should also help make sure you are using the right vocabulary – and that you are not assuming too much. If you are unsure of what this means take a trip to a local dance class. Join a group where the level of instruction is challenging to you. Return the following week and see just how much you can remember. If you can break down all the steps you have been taught a week later then you can expect the same from your child. My grandparents had a party line on their farm. This was an arrangement where six other farms shared the same telephone line. Each farm had a distinctive ring. It was amazing how the brain simply cut the noise of unwanted rings out. Our number was three short rings. If you heard a ring starting with a long ring you did not bother to listen to the rest. Some telephones seemed to ring more often than others. The phones always rang more on births, deaths and weddings. One farm never seemed to get a telephone call. When visitors came to the farm they always asked if the phone had run for the silent neighbour. The line was a `party’ line so anyone could listen in. I understand that the trick was to try to pick up the phone at the same times as the recipient of the call. This did away with the need to try to disguise an offending click. Background noises could identify who was picking up the phone. The sound of a clock ticking was a give away. When the party lines were abolished the ability to overhear conversations died away – to a certain extent. Today we are back in the realm of shared conversations. The digital phone sends messages, pictures and videos. Every ten year old is `phone literate’. The answer is sent back. All in under a minute. This is real progress. It looks as if the party line is not dead – it just went into hibernation for a few years. What makes a day into a memorable `Two Ice cream Day’? We know that the sun was shining and the beach was crowded. Hundreds of people were enjoying the beach. I did not see one child hunched over a packet of eleven plus papers. There were plenty of buckets and spades. Naturally some people were reading newspapers. I even saw one or two people lying on their stomachs reading paperbacks. There was a grammar school within a few miles of the beach. In a large bookshop there were a few eleven plus books and papers. So how were the families going to prepare? An early solution would be to find a foundation mathematics text book. The work on decimals and percentages would be laid out correctly. A Key Stage 3 book would also be useful. Naturally you would need to get a good Key Stage 2 book for revision. Why would you want to but a key Stage 3 book or a Foundation mathematics book? Quite simply the examples are laid out in a clear and concise manner. There will be few pictures. You will not need to do all the chapters of the book. Sometimes you will find that working through worked examples has to be better than struggling through a paper. Anyway – if you get bored why not try a second icecream? The children on the courses have just an hour left to go before they go home. One of the mothers was sitting in reception waiting for her daughter. I asked her what she was going to be doing over the Easter weekend. She then mentioned that family and friends were expected for lunch on Sunday. The question of wine came up. Her eyes glazed over and she smiled. 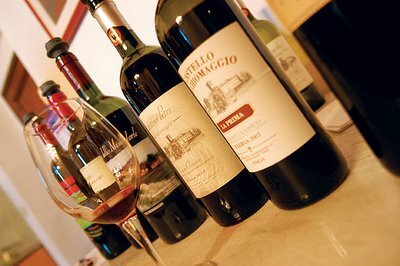 My son and his wife Jackie have just returned from Tuscany where they took this picture of wine. I showed the picture to the mum. From the ensuing remarks it seems that in one household there will be no thoughts of eleven plus over the weekend. On Sunday morning the family will not be sitting with an eleven plus paper. Cooking, eating and drinking will be the order of the day. We wish them well! We hope you all have a pleasant weekend. Our children today live in a world where we have made wonderful advances. Our children are brought up to believe with science and technology we can achieve almost anything. When Caxton invented the first known printing press he was obviously looking far ahead. He printed over a hundred books in his lifetime. It is difficult not to put words into his mouth – but he would probably have been very excited at the idea of `ebooks’. `Ebooks’ can be downloaded from the internet. You can read a number of pages from the book – and make up your mind whether you want to buy the book or not. This saves going to the library, selecting three or four books, and not enjoying any of them after the first few pages. Even the major bookshops like W.H. Smith carry examples of `ebooks’ on their website. Caxton focused on what were considered, in those days, to be `important’ books. Through `ebooks’ we can sample many different types of books - not only fiction and non fiction but also biographies, romance, travel and the environment. We know that many of our bright eleven plus children are socially aware. Many of them will be concerned about the environment and aware of issues like the mountains that have been torn apart, seas, rivers and oceans polluted. Our eleven plus children will also be concerned about forests have been destroyed. Naturally our children will also be aware of benefits of the advances in technology. I wonder what Caxton would have felt if he had been able to lie in the shade, over looking his swimming pool, reading a section of a book that had been downloaded from the internet by a wireless connection? Our children can do just that. They can even lie beside the self same pool working through an `online eleven plus paper’! Surely this must be progress. If it is not progress then perhaps we are expecting too much from our children. For a select few children the days of being able to lie beside the pool feeling relaxed and `on holiday’ are long gone. Poor kids! This is rather a dramatic statement. I remember reading about the rack as a child. The idea of having one’s legs and arms attached and then being stretched did not appeal to me as a child. Imagine the feeling as your arms popped out of their sockets. Imagine being tied to a chair and having to watch a friend or member of the family being subjected to the torture. Surely it would be easier to simply read a few pages of a book? We have all sat on trains and observed our fellow travellers sitting and staring into space. Without something to read a prolonged journey must be like having to endure physical pain. Intolerable! Some years ago we were given the privilege of helping a young twenty four year old man to learn to read. He had become a mercenary in the Congo at eighteen because he had left school without being able to learn to read and write. He wanted to learn to read because his lovely young wife was about to give birth – and he wanted to be able to read stories to his children. He just wanted to be able to read to his young child to be. He was not thinking about educating himself, there was no thought of examinations – it was simply the role of a father that was driving him on. We hope as the years have gone by that he has become more that a man staring into space. We hope too that he no longer regards reading as a torture. So talk to your eleven plus child. Remind them of the wonderful privileges that they are being exposed to. Ask your child to consider that an education in a university is far superior to four years on the battlefields of the Congo. Suggest that they simply settle down and do some reading. We all have a variety of clothes. Let us start at the top. There are the party clothes. These are the dresses, suits and dinner jackets that are wheeled out on special occasions. If the event is `important’ enough we can always justify buying yet one more piece of party clothing. Then we have our work clothes. There are the clothes we wear on a daily basis to go to work in. Enough said. Next come our holiday clothes. They are always just that little bit brighter and slightly more sensational. Then our relaxing clothes. We wear these when we are certain that no one will see us. They are the sort of clothes we change out of when we go shopping. What we wear reflects our moods, instincts and passions of the day. Our clothes determine how we are going to behave and how we will deport ourselves. Our clothes send signals to our family, friends and even to casual observers. We all can remember a teacher who wore a red top on some days – and the whole class was quiet and prepared for war on that day. Handwriting sends out similar signals. Some children will always have neat and tidy writing. These are the children that tidy their bedrooms. Other children will have a mixture of neat and untidy writing. Then there are the children who almost take pride in being untidy and illegible. These are not the children with writing problems - they are the children who are able to write letters neatly but choose to be `otherwise’. Amidst all the clutter on the page, look carefully for letters that are regular in shape and size and have good proportions of letter parts. There could be just one example on a page. Build an encouraging sentence together that encompasses most of the letters. Invite your child to write just one sentence neatly and carefully. Praise the neat letters. Extol the virtues of neatness. Take just a few letters a day. Build the change in attitude towards writing step by step. Never show frustration or anger. Look for positive progress. When you have achieved a degree of success, reward this with a prize. If you are not sure of what to give you can always go shopping and buy some clothes. Naturally you will want to purchase some for your child for all their hard work and endeavour. More importantly buy a `little something’ as a reward for yourself. It will make you feel better. When we are stressed excess adrenalin makes our blood thicken. An excess of adrenalin can be very useful just before an examination – as it heightens awareness and gives that little spurt of nervous energy. Blood that is too thick, as I understand it, can have a disastrous impact on health if the stress is prolonged. What you need to do is to feed you, and your child, food that will help to prevent the blood becoming too thick and will thus allow the blood to flow freely. Children sometimes may go through a phase of not wanting to eat vegetables or fruit. You will need to disguise your offering. Mix a smoothie with celery, rocket, an apple and half an avocado. Juice it up. Pour it into a long thin glass. Do not accept an argument. Insist that the stress reliever is consumed. Remind your child that exercise helps to relieve stress. Explain that activities like vacuuming and dusting count as exercise. Throw in bed making and tidying drawers. Settle down to watch your child flying round the house. Think of other ingredients to add to your smoothie. Indulge yourself – it may be some time before your child believes what you say.